​​HOUSTON, Texas - Saturday night’s Final Four will see a battle of #2 seeds when the Villanova Wildcats, winners of the South Region, meet the Oklahoma Sooners, who cut down the nets in the West. In what is sure to be one hell of a basketball game, us fans are in for an added treat as this game will bring together two of the hottest offenses in the country. Villanova is currently averaging 82.3 ppg thus far in the tourney, while the Sooners are dropping 81.0 ppg. For Villanova, their offensive output can be attributable to one thing – making shots. Through the first four games of the tourney, the Cats are 120-212 (56.6%) from the field, and a mind blowing 39-84 (46.4%) from behind the arc. It is no surprise that Coach Jay Wright’s offense revolves around the perimeter game, and when that goes well, so do the Cats. For years now, the Cats have been labeled primarily as a jump shooting team, oftentimes starting 4 guards and 1 post player. The knock on this style has been that when Nova is cold from the outside, that they have no Plan B option to turn to, and often exit the NCAA Tournament on such nights. The good side, however, is what we have been seeing over the last two weekends: a team shooting better than 56% from the field and whose average margin of victory is 19.3 ppg. But outside shooting has not been the only cog in the Wildcats’ wheel. While it is safe to say that when Villanova is hitting their outside shots – especially at the rate that they have been knocking them down this tournament – that they are very tough to beat. But an even truer statement is that when they are hitting their outside shots and defending in the manner in which they have been defending, they are virtually impossible to beat. The best thing that came out of last Saturday night’s 64-59 victory over top seeded Kansas in the Elite Eight was the fact that Villanova did not shoot the ball especially well, but was still able to win the game. Why? Because they defended with reckless abandon, just like they have been the entire tournament. 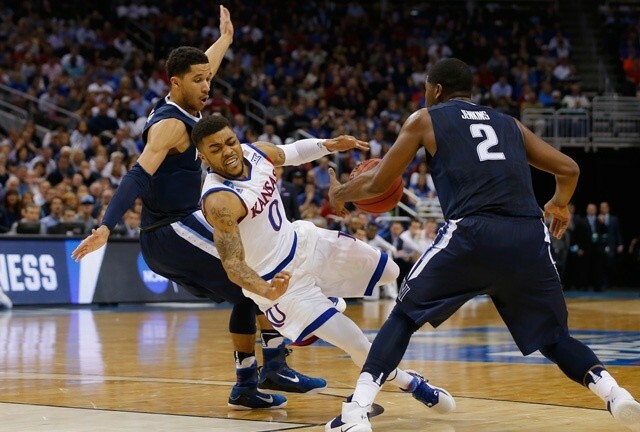 Nova forced the veteran Jayhawk team into committing 16 turnovers, while pocketing 11 steals. And this was no frosh backcourt that hasn’t been here before. No, sir. This was a three-guard lineup (two juniors and a sophomore), out of the mighty Big 12 Conference, with 285 games of collective experience under their belts. Despite that, Villanova was able to exert enough pressure at the top to disrupt Kansas’ offensive flow. In doing so, Kansas was never able to gain their full composure throughout the contest. That was quite evident in the offensive production of the Jayhawks’ two leading scorers, senior F Perry Ellis, who was held to just 4 points on 1-5 shooting, and junior G Wayne Selden, who scored 16 points, but who was just 6-14 from the field, including 0-6 from three, and who at times struggled just to hit the rim from the outside. On Saturday night, Villanova needs that same effort, and maybe a little bit more. While Kansas may have had the best team in the country, Oklahoma certainly has the best player in the country in Buddy Hield. The senior guard, who has been phenomenal the entire season, has been lights out in the NCAA’s. Through 4 games, Hield is averaging 29.3 ppg on 56.7% shooting from the field, and has hit 19 of 40 (47.5%) from three. 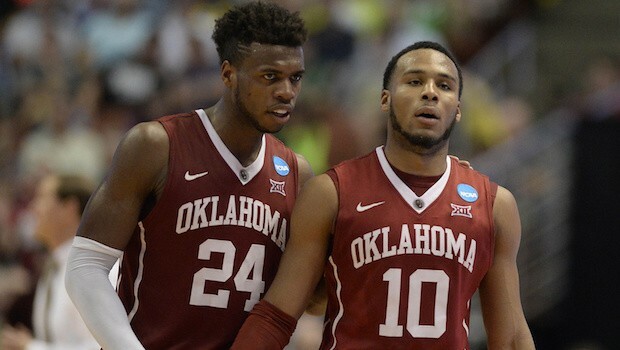 Yes, you can say that Buddy Hield has been feeling it. And while the West Region was, in fact, the Buddy Buckets Show, he did have help, mainly from his perimeter teammates, Jordan Woodward and Isaiah Cousins. Woodward was instrumental in all four of the Sooners’ victories leading into the Final Four, averaging 16.8 ppg on 51.2% shooting, including 11-19 (57.9%) from three. Cousins, likewise, has been an integral part of Oklahoma’s success with his steady 11.0 ppg, 4.0 rpg and 5.3 apg. Even greater than the Kansas trio, Hield, Cousins and Woodward bring with them 371 games of collective experience for Oklahoma. The game, as you would expect from these two teams, is going to come down to perimeter play and execution from the playmakers. Villanova has to continue to move the ball on offense, create open looks and, most importantly, knock them down. If you recall from the original matchup between these two schools back on December 7th – a game won by the Sooners 78-55 – the Wildcats shot 20-63 (31.7%) from the field, including a pathetic 4-32 (12.5%) from three. That obviously cannot happen on Saturday night, no matter how dominant their defense is. Speaking of defense, the Cats need to continue to get after it and be aggressive on the perimeter. They must force the Sooners out of their normal rhythm as often as possible and, most importantly, stretch the court. By that I mean extend the defense and make Cousins and Woodward start offensive sets as far from the basket as they can, which Mikal Bridges and his 6’7” frame did a nice job of against Kansas at the head of their zone. Oklahoma will also need to secure the perimeter. If Villanova shoots 45% or better from three, it is going to be an uphill battle for the Sooners. Offensively, the Buddy Hield that we have been seeing the last four games will need to continue to show up, but he will need help. It is possible for Hield to go for 35 and Oklahoma still lose the game. Villanova may be resound in letting Hield get his, and just concentrate on closing everyone else out. I doubt it, but with the way Hield has been shooting the ball, it is quite possible. The last thing Jay Wright wants is for his team to only focus on stopping Buddy Hield, and in doing so, allowing Woodward and Cousins to combine for 55-60 points, which they are more than capable of doing. With that being said, the Sooners will need a team effort offensively, which has been the case so far this tourney. This is by no means on knock on Daniel Ochefu, Khadeem Lattin, or Ryan Spangler, but this game is going to come down to guard play on both the offensive and defensive sides of the ball. The winner of the battle of the backcourts is almost certainly going to win this game and move on to play for that coveted national championship Monday night. It is going to be a good one.